Thank you for your interest in LuLaRoe Simply Comfortable Clothing with Barbara Melillo!! LuLaRoe sells women's dresses, maxi skirts, pencil skirts, a-line skirts, sheath dresses, and they are all simply comfortable. We sell at home parties and online on Facebook. LuLaRoe consultants bring a pop-up trunk show to your home or you may shop in their LuLa Room. These parties are run like a boutique. All the inventory is set up, and friends can come and go in a drop in and shop setting as they please, try on items and purchase on the spot. Our pieces are comfortable, fun and affordable and there are no presentations, ordering, shipping costs and no pressure or obligations. Just a fun morning, afternoon or evening with all of your friends and great clothes! The more the merrier, too! 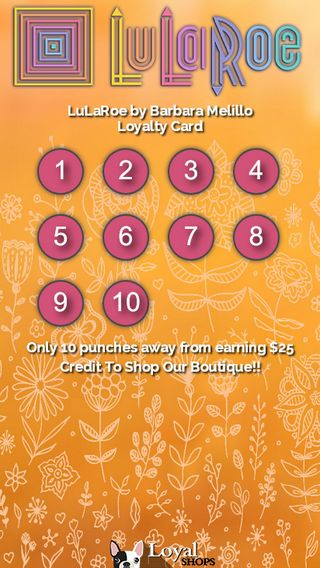 Hostesses receive generous shopping discounts, perks when additional boutiques are scheduled, and one FREE item or $25 Credit for every 10 that are sold and more! Pop-ups can be held locally or even online. Contact me to schedule a Pop-Up!! You can shop all my current LuLaRoe inventory by joining my Facebook VIBP Shopping Page! There you will have first access to all the fabulous new pieces as soon as they come in and can claim any items you would like! I launch all new clothes at least once a week! Just click the Facebook logo below to request to join my shopping page! LuLaRoe is unique clothing with over 400 prints weekly, and then a small run is made with each pattern. When that fabric runs out, it is retired. When I receive a style, get it before it’s gone. We offer modest styles and generous sizing, we have something for almost all body types and sizes. With LuLaRoe you get timeless design, high quality wearable fabrics, impeccable fit, beautiful boutique patterns and all direct to you for quality and a great price! My contact information is below, so feel free to reach out to me and join my Facebook page below for online shopping. Enter your email address below to sign up for a loyalty card from Barbara Melillo.